Hallo, ich bin Brigitte Osenbrück. Ich wohne fast mein ganzes Leben in Beyenburg, einem ländlichen Vorort von Wuppertal. Daher der Name Beyenburgerin Design. Hi, I am Brigitte Osenbrück. I live in Beyenburg, a rural suburb of Wuppertal, Germany, almost for my whole life. 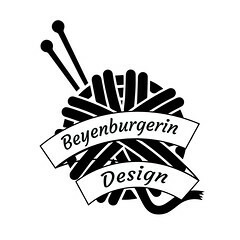 That is why I chose the name Beyenburgerin Design. My mother taught me how to knit and crochet when I was four. When I was 13, the knitting virus caught me all of a sudden, definitely wooloholic and that lasts for more than 40 years now. Since then, there is hardly a day without knitting (I sometimes crochet as well). A few years back, friends asked me to write down the patterns of my designs. That is how Beyenburgerin Design finally started. About ten years ago I started to write patterns. Shawls, scarfs, cowls, hats, sweaters, jackets in large sizes (I wear a large size myself), knitfelted bags, I just enjoy the whole range of projects of my beloved knitting. My patterns are step to step and detailed, with photos and charts whereever they are helpful.